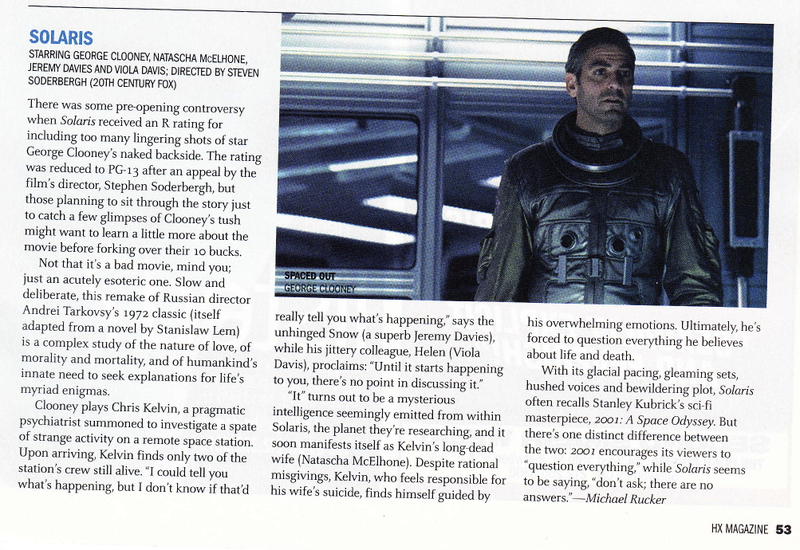 Solaris generated some pre-opening controversy when it received an R rating for including too many lingering shots of star George Clooney’s naked backside. The rating was reduced to PG-13 after an appeal by the film’s director, Stephen Soderbergh, but anyone planning to see it just to catch a few glimpses of Clooney’s tush might want to learn a little more about the movie before forking over their ten bucks. Not that it’s a bad film, mind you; just an acutely esoteric one. Slow and deliberate, it’s a complex study of the nature of love, of morality and mortality, and of humankind’s innate need to seek explanations for life’s myriad enigmas. “It” turns out to be a mysterious intelligence seemingly emitted from within Solaris, the planet they’re researching, and it soon manifests itself as Kelvin’s long-dead wife (Natascha McElhone). Despite rational misgivings, Kelvin, who feels responsible for his wife’s suicide, finds himself guided by his overwhelming emotions. Ultimately, he’s forced to question everything he believes about life and death.